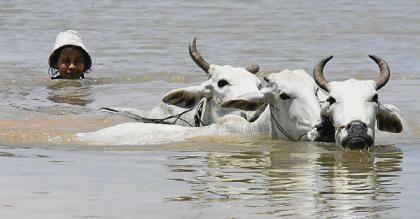 WASHINGTON (Reuters) – Some U.S. aid is getting to the people of Myanmar and Washington plans to provide $5 million more in disaster relief in the aftermath of Cyclone Nargis that devastated the country in May, U.S. first lady Laura Bush said Wednesday. 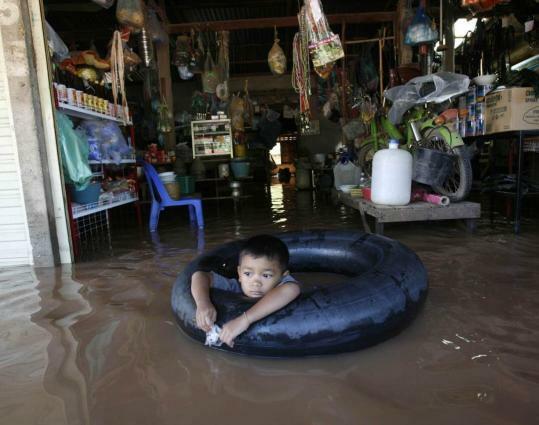 The United States sent about $75 million in relief and the reclusive military junta in Myanmar allowed at least 100 U.S. flights after the storm slammed the Irrawaddy delta, killing more than 130,000 and leaving more than 2 million destitute. Bush, speaking to the Council on Foreign Relations in New York to mark the 60th anniversary of the International Declaration of Human Rights, said the U.S. Agency for International Development would send $5 million more in aid. “This assistance will support the efforts of nongovernmental organizations like the World Food Program and Save the Children to ensure access to clean water, adequate shelter, basic health services, and other essential needs in the most affected areas,” she said. She noted that a reporter from the BBC went to the delta recently and made an interesting discovery. “We saw photographs of the shacks that the people who lived in the delta are building — rebuilding to rebuild their homes, and they were built out of the rice sacks that were stacked with USAID and American flags,” she said. 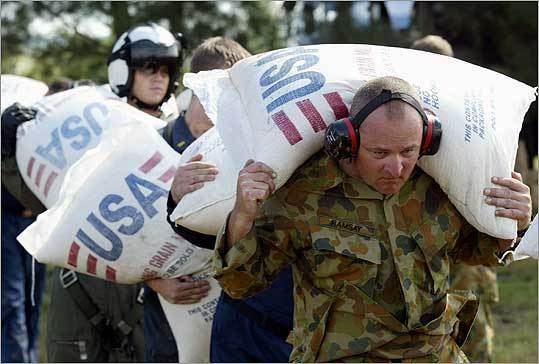 “So we do know that some of this relief we’re sending into the cyclone area is getting to the people,” Bush said. Just a few weeks before she and her husband, President George W. Bush, leave the White House, Bush pledged she would keep pushing for democratic reforms in Myanmar, previously known as Burma, after leaving Washington. “I’m going to pay, really, a lot of attention to these two issues, the international issues that I’ve worked on the most, both Afghanistan and Burma,” she said. Myanmar’s military junta has refused to accept losing a 1990 election and has cracked down numerous times on pro-democracy demonstrators, killing thousands. 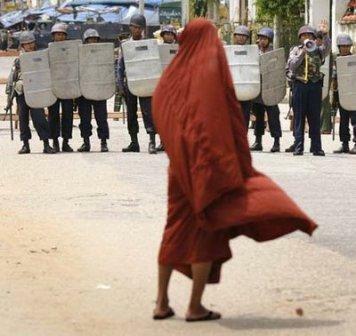 What do the Thai demonstrations mean for Burma? … has begun to heavily invest in Burma’s oil and natural sector. A man selling gas at a market near Inle Lake, Myanmar. Photo courtesy of FLICKR/geminder. .. 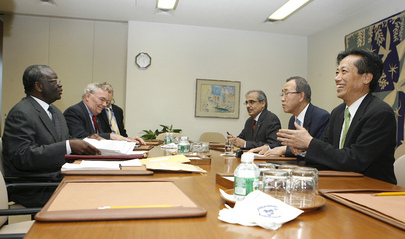 Among the previous winners are the Burmese opposition leader Aung San Suu Kyi and ex-UN secretary general Kofi Annan. 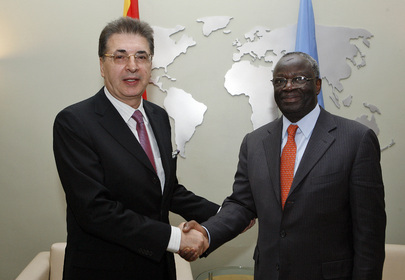 UN envoy Ibrahim Gambari losing credibility? Ethnic opposition party leaders have not been allowed to meet United Nations special envoy, Mr. Ibrahim Gambari who is in Burma on a five-day visit, though ethnic leaders demanded a meeting…. 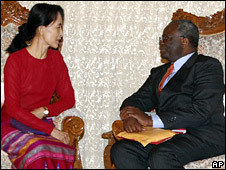 Yangon, Myanmar: U.N. special envoy Ibrahim Gambari, hoping to promote democratic reform in Myanmar, will extend his five-day visit until Saturday in an apparent effort to meet detained opposition leader Aung San Suu Kyi…. TOKYO —Japan will introduce the so-called third-country refugee resettlement program as early as fiscal 2010 as the first Asian country to do so in a bid to accept more foreign refugees, government sources…. The Olympic Games: A Propaganda Victory for China? 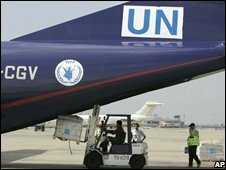 The United Nations has acknowledged that over the past three months some $1.60-million in aid for the victims of the devastating cyclone in May has been lost to Burma’s odd foreign exchange regulations. Mark Farmaner is the Director of the Burma Campaign in the UK. He says that hopes of a breakthrough in negotiations are low. … League for Democracy leader is intended to create a positive impression for United Nations special envoy Ibrahim Gambari, who arrives in Burma today. Bridging the gap: Myanmar refugees and members of Mt. Hope Presbyterian Church enjoy a game Sunday. The children threw themselves into the games, but language gaps slowed interaction between adults. Burma’s ‘Blood Jade” Used in Olympic Medals? Soldiers about to close off access to Rangoon’s Sule Pagoda, during the protests of September, 2007. Increasingly, dissidents are questioning the utility of direct confrontation with the government. Photograph by Christian Holst. … missing the opening rites in Beijing as a protest against the Chinese government’s continuing support of the military junta in Burma or Sudan. .. But the Myanmar Foreign Trade Bank, the principal bank in Burma that is used by several aid agencies to transfer aid money, on Thursday told Mizzima that ..
Bush as Human Rights Champion? Ladies who say and do!